Whether you’re in the mood for a classic burger and fries or want to choose something a little healthier like a turkey burger and salad, Tasty Burger delivery has your options covered day and night. Read on to find out where, when and how you can make sure to have your selection delivered to you. Tasty Burger’s main offering is a classic American favorite: the hamburger. The establishment aims to stand apart from the competition by being a neighborhood experience with Boston pride. It’s made a delicious name for itself as the official burger of the Boston Red Sox and the Boston Calling Music Festival. If you ‘CLICK for DELIVERY’ on the Tasty Burger website, you will be redirected to DoorDash (a third-party food courier company). 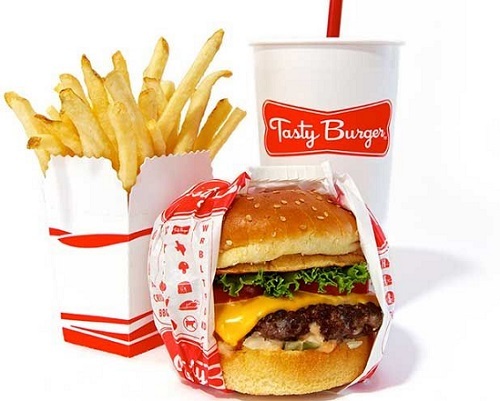 Tasty Burger does not have its own delivery methods yet, but the direct link to DoorDash suggests that Tasty Burger has partnered with DoorDash and you may receive more efficient service or solutions to any issues that come up in comparison to competitors like Postmates and UberEats. The menu offered by DoorDash does not include all items from the online menu (offered at official Tasty Burger locations). Be sure to confirm that the items you wish to purchase can be delivered. For example, “Tasty Ale” a special Sam Adams draft beer, is not on the delivery menu but is available in store. A benefit of ordering online is that there are options for add ons or removals, suggested sides, and a text box for specific instructions. You don’t have to worry about a rushed cashier missing your allergy information. It’s right there on your order! Services like DoorDash sometimes make exceptions for different requests. Let’s say you really want to let your family pets try “Tasty Dog Biscuits,” but it’s not on the delivery menu. You may be able to put in a special note on the online order form or call to specify your request. DoorDash also has a convenient app for iOS and Android so that you can order on the go. There are currently 5 locations in Massachusetts and one in Washington DC. All locations open at 11 AM, but there are different hours for closing depending on the day of the week and location. If you’re looking to get a Tasty Burger Delivery at night, make sure you order before the delivery hours end. The last call is often earlier than the store closing hours, which cater to local nightlife. Delivery is offered from all the Tasty Burger MA locations: Fenway, Dudley Square, Harvard Square, Southie, Back Bay. The “CLICK for DELIVERY” option is not seen on Tasty Burger’s website underneath the DC address, but the Tasty Burger menu is available on DoorDash for the DC location, so don’t worry DC residents! The times you can place an order with DoorDash end earlier than the physical Tasty Burger locations (i.e. late night). You can place an order for Tasty Burger with DoorDash between 11:00 AM – 11:29 PM. The average wait time is between 25-40 minutes, from order to delivery (including food preparation time). Longer wait times may be the result of larger orders being prepared or those placed during dinner time/rush hour traffic. Tasty Burger delivery fees are directly controlled by DoorDash. DoorDash charges a delivery fee ranging from $0.99 to $7.99 with increased rates during busy times when fewer drivers are available (similar to surge pricing for Uber). There is also a Service Fee of 9.99% of the order cost. You have the option to tip preset percentages or a specific dollar amount (or none). If your order total comes out to less than $10.00, you will have to pay a “Small Order Fee” of $2.00. There is a maximum order amount of $100.00. DoorDash charges all Tasty Burger delivery prices. These costs are subject to change and you will not find them on the Tasty Burger’s website. Read your order and fees carefully before submitting to make sure everything is correct, and you should have no issues. If something does come up, you can call or email DoorDash or call the store directly. Tasty Burger uses only American all-natural beef, free of hormones and antibiotics to make the patties. Customize your order with options for everyone, including add-ons of egg, bacon, cheese, another patty or a swap for the dairy and gluten free roll. The menu also includes chicken, turkey, and veggie burgers, chicken nuggets, hot dogs, salad and kids’ items. They also offer mini pies, homemade raspberry lime rickey (drink) and even Tasty Burger dog biscuits. One of their standout menu items is the “Sack of 5 Burgers” for take-out only. The savings add up to $0.10 per burger. Still, the real excitement comes from considering where else can you get burger sacks or take-out only menu items? Tasty Burger does its part to support sustainably sourced products and green practices. If you want to support them, you can also purchase “Tasty Gear.” This package includes gift cards, t-shirts, hats, koozies and even baby and dog gear. Although you won’t see a Tasty Burger team member if you order Tasty Burger Delivery, you can take comfort in knowing that they wear a pin that reads “Customer 1st”. They put the guest first and want everyone to enjoy their food and experience. Tasty Burger Delivery is a great way to try a local Boston take on American favorites. This company has competitive prices. Also, the convenience of delivery will allow you to enjoy your customized order anywhere with just a few clicks. Don’t forget to follow Tasty Burger on Facebook, Twitter, and Instagram. Share your opinions or pictures and let us know what you think! Hey Buddy!, I found this information for you: "Tasty Burger Delivery 101 – Areas, Hours, Fees". Here is the website link: https://all2door.com/tasty-burger-delivery/. Thank you.